Over the last eight years, I’ve written hundreds (probably thousands!) of blog posts for dozens of different blogs. When I got into blogging ten years ago (yikes), the prevailing advice was to “choose a niche”. 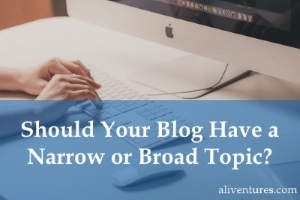 Since then, many bloggers have realised that picking a very narrow topic can become limiting. So how can you strike a balance between staying focused and yet giving yourself enough space to explore a range of interesting ideas? This post takes a look at how to decide what your blog will be about … and how it’ll be distinguished from lots of other blogs that cover similar topics. All bloggers sometimes struggle to come up with ideas – especially if they’ve been blogging for a while. 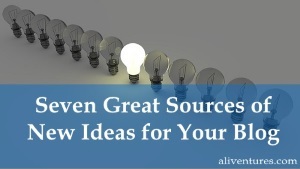 In this post, I take you through seven great ways to come up with blogging inspiration … from thinking like a beginner to borrowing a title idea from someone else. If you find that weeks or even months go by without you publishing any posts on your blog, then it’s important to get into a good blogging routine. 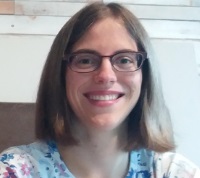 This post explains how you can do that, by taking little steps (like figuring out a time slot for writing posts, and coming up with a publication schedule) – with plenty of examples along the way. 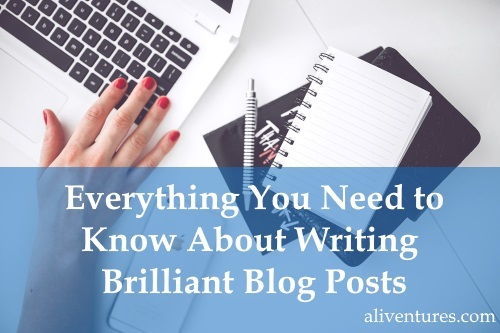 The beginnings and endings of blog posts are crucial but they can be tricky to get right, so it’s good to have a few tricks up your sleeve. Here, I give you a list of easy ways to start and end your post … each with an example from a different blogger’s work, so you can see exactly how they work in practice. Do you need to blog to promote your novels? 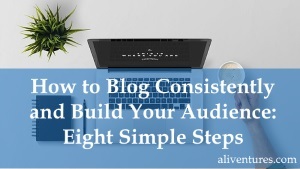 Different people have different takes on this one – and if you do decide to have a blog, there are several ways you could approach it. 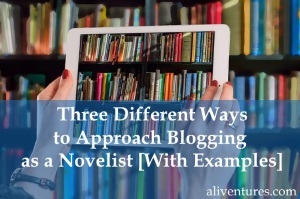 In this post, I go through three examples of different writers’ blogs so you can figure out what might suit you (and your books) best. 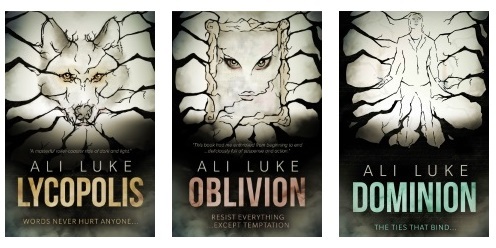 Are you missing out on the Aliventures newsletter? It comes out by email every Thursday, and includes a short article about writing or blogging, plus updates on anything new I’ve got for you! It’s completely free, and newsletter members get access to a little library of mini-ebooks, including Ten Powerful Ways to Make Your Blog Posts Stronger and Ten Easy Ways to Attract Readers to Your Blog … and Keep Them There. Find out all the details and join here. Thanks for the advice and links. I feel you can blog about a narrow topic, and still give yourself permission to blog about other topics once in a while. Better yet, try to link two unlikely subjects. Imagination is our strength when we are writing. Thanks Ingmar, glad you found this helpful! I like your suggestion of linking two unlikely subjects — that can sometimes result in a really interesting and creative post. Hi Ali, Thanks for the effort you did to write this worth reading blog post. You have mentioned that start and ending are the most important part of any post. Kindly can you through some more light over that. 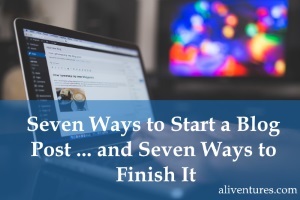 The start of your post is really important because it needs to hook the reader and convince them to read on. It also needs to set up what’s to come (e.g. you can’t have an introduction that promises a lot unless your post will actually deliver on those promises, otherwise readers will feel cheated). The ending is really important too because it’s your chance to make an impact on the reader: you might want to think about the message or key point you want them to remember. It’s a great place to put a “call to action” where you prompt readers to do something — like leave a comment, or check out one of your products / services. Thank you for this useful post. You put together a lot of great resources. Blogging is one of my passions and it’s always good to have someone on the other side who understands the process well. To me, the top thing to do is to write no matter what. It’s easy to get lost by doing small improvements and tinkering with the code. Writing is the top 1 thing which leads to success. Let’s go do it! Thanks for the inspiration! Thanks Rafal! And good point about just writing — there are so many aspects to blogging that sometimes the writing itself can get a bit crowded out, can’t it?! Thanks for putting this together to help us find useful articles you wrote in the past. I’m just so overwhelmed by the quantity and quality of useful content you have published here. Been clicking and reading and getting enriched. Sorry for the slow reply, Margaret! It’s definitely possible to change your URL and the name of the blog, and there are various options you could use to keep as many of your readers as possible (e.g. redirecting the old URL to the new one, using a 301 redirect). Ultimately, if you don’t feel like your blog’s name and URL are a good fit, change it. You might find you lose some readers in the change over … but even if you do, those readers might have wandered off anyway! You’ll also hopefully feel inspired and enthused to keep blogging, and your new name/URL might be more appealing to potential future readers, too. Best of luck with the change! Note: This post was originally published in 2012, and was updated in June 2018. One common issue that standard writing advice covers is how to cut down your first draft. And this advice comes up time and time again for a good reason. It’s easy to over-write, perhaps telling the reader things that you’ve already shown them, or using five words where one would do, or repeating yourself unintentionally. But under-writing is a problem too – and one that I don’t often see tackled. You were supposed to write a 1,500 word essay for school, but you finished in 800 words. You’re entering a 2,000 word short story competition, but your story is over after 1,000. You know that novels in your genre should be at least 80,000 words, but yours is only 50,000. You want your blog posts to be at least 500 words, but they keep coming out at 300. Your first task is to establish whether or not the work is, in fact, complete. Perhaps you’ve written a fantastic novella, and there’s not really any scope to expand it (even if that means that it’s going to be tough to get publishers to take it on). Maybe you could use that 1,000 word short story for a different competition. It’s tough – really tough – to be objective about your own work. If you’re concerned that a piece might not be working at its current length, ask a friend (ideally a fellow writer) to take a look. See whether they think it’s rushed or incomplete. Some writers manage to add more words without adding any substance: instead of expanding a too-short piece, they pad. They add “fluff” – unnecessary, unwarranted material that weakens what they’ve written instead of strengthening it. Padding is frustrating for the reader. All those extra words don’t add value – they just diminish the power of the rest of your piece. There’s a crucial difference between expanding and padding, even if the two look similar at first glance. Expanding your work means going deeper. Padding it means staying on the surface. Add a relevant sub-plot: one that sheds light on the themes, heightens the tension in the main plot, or reveals crucial information about the characters. Include the next part of the story: take it further in the character’s lives (perhaps what you think is a finished novel is just part one). Look for places to add more tension and conflict. A minor incident could become something much worse. Turn important passages of summary (“telling”) into action and dialogue (“showing). If your hero did something terrible in the past, show us the event or the effects of it, don’t just tell us in a sentence or two. Read Understanding the “Show Don’t Tell” Rule for more help on this. Include a different perspective or point of view. This is a great way of digging deeper into a topic. Add useful examples, and give enough explanation to ensure the reader understands them. Recommend other resources – books, articles, blogs, etc. This is a great way of letting the reader take control of their journey, so they can dive deeper into the aspects of the topic that interest them. Add extra sections (or chapters, if you’re writing a book) to cover ideas that have occurred to you since you started working on the piece. 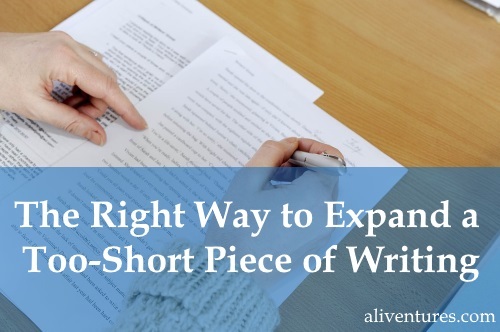 You might find it useful to print out the too-short piece, so that you can write notes on it easily. Work through scene by scene or chapter by chapter or paragraph by paragraph, and look for places where you could go deeper. Focus on giving extra value to the reader, rather than simply increasing your word count. When I started out as a writer, I was convinced that “proper” writers wrote 1,000 words a day. (I got the “1,000 words” from a few different places, including Stephen King’s excellent book On Writing.) Trying to fit in 1,000 words around a full-time day job, though, was really tough. If you’ve tried it, you’ve probably found the same thing: it’s do-able for two or three days in a row, but after that, you soon start hating the sight of your work-in-progress. Writing shouldn’t feel like a chore. Sure, sometimes you need to overcome a bit of reluctance or resistance so you can sit down and write – but, overall, you want to enjoy your writing. So … don’t write every day. Unless, of course, you really want to! For me, writing on three – four days each week felt about right; for you, the balance might be slightly different. This is especially true for bloggers. I’ve read a lot of posts recently that indicate a backlash against the “blog every day” principle that held sway a few years ago. There’s no point in you churning out half-hearted content that readers will ignore; it’s much more effective to write one or two great posts a week. There’s a broader point here, too. Not all writing advice will work for you. Try things out, by all means … but don’t ever feel bad about ditching something that’s not a good fit. This mini-article is just 240 words. That’s about average for my newsletter pieces: I want them to be quick reads that deliver some useful ideas or tips without taking up much of my readers’ time. But let’s say I wanted to use that article as a basis for a post here on Aliventures. It would need to be at least twice the length (500 words) to work well as a blog piece (and probably 750 – 1,000 words would be better). For #1, I could expand this to look at both angles, with half the post covering “why you should write every day” and the other half covering “why you shouldn’t write every day”. For #2, I could include quotes from writers who give different perspectives on how often is the right frequency, and on how many words they usually write per day or week. For #3, I could link to and summarise related articles, perhaps on finding a good writing rhythm, writing consistently, writing around a day job, and so on. For #4, I could change the topic and focus on the point that I make in the last paragraph: “Not all writing advice will work for you.” That way, “Write every day” could become just one point in a much longer post. I wouldn’t use all four methods at once – but one or two combined could turn this quick newsletter article into a much more in-depth resource. So, over to you! Choose a piece of your writing that’s too short for its intended purpose, and use one of the four above methods to expand it. Enjoyed this post? Make sure you don’t miss the next one. You can get new posts straight to your inbox (just pop your email address in below).